Maggie Ball has more than 20 years of experience in quilt making and has taught quilting to low-income Mongolian women as well as 850 children in Bainbridge Island schools. She has also brought her experience as expert quilter and quilt designer to bear in the books she has written on the topic. Creative Quilting With Kids (2001) is a book that is full of exciting quilting projects for the young. Patchwork & Quilting With Kids (2003) features more projects and includes lots of photographs. In Traditional Quilts with a Twist (2006) Ball offers creative new looks for quilters. From contemporary fabrics to combining patterns and colors, this book instructs adult quilters on how to use their own interpretations to create unique variations on traditional themes. 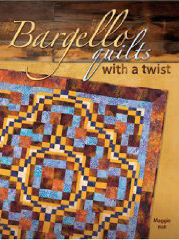 Maggie Ball's most recent book Bargello Quilts with a Twist (2008) focuses on traditional Bargello quilts and provides the weary quilter with new techiques to tackle this challenging quilting style. In addition to writing about quilting, Ball also makes art quilts and exhibits them on a local and national level.